Yesterday we lost a great one. Not only did he have an impact on music in a way that can't be measured, but he also had an impact on fashion, sexuality, gender boundaries and on my childhood, first through his role as The Goblin King and then through his music, opening my mind to the idea of what rock and roll could be. He was a beautiful man, in spirit, talent and body and he will be sorely missed. Graphic by me. Images from the internet. There is an empty spot on this earth now, but not in the sky. David Bowie has gone home. Thanks, darling. 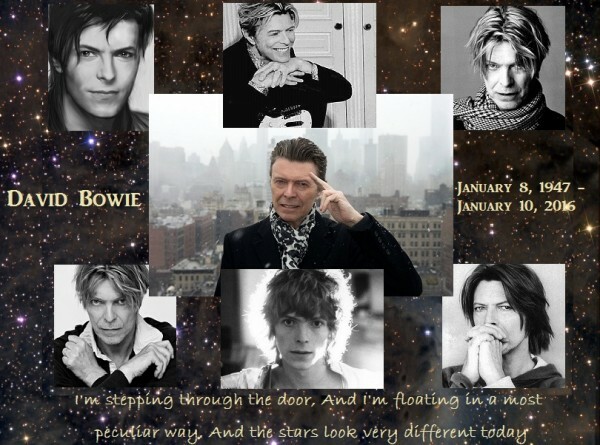 I still tear up thinking about how Bowie has gone back to the stars. Lovely tribute. You said it for me. Thank you. Bowie is finally free of his mortal form, which seems fitting to me, though he will be missed down here.